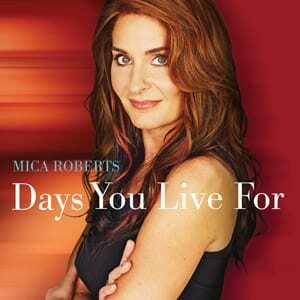 Mica Roberts’ new single release is “Days You Live For,” and the Oklahoma native is busy making the radio rounds to get the word out. A talented vocalist and musician who hit the road after high school, Roberts earned her performance stripes playing amusement parks, campgrounds and on a cruise ship before landing high profile jobs as an in-demand backup singer. If you want to know Roberts, you are going to have to get to know her hometown Locust Grove, Oklahoma. A tiny town of 1400 people, Locust Grove is about 50 miles east of Tulsa and is still the place Roberts calls home. She still owns the family farm there where she grew up and forged her lifelong love of music. When Mica arrived in Nashville she did everything she could to get a job. “I just wanted to stay there and support myself,” Mica recalls. “I waited tables and sang in a local club called the Bull Pen Lounge.” In 1997, nine years after she made the move to town, she she became Faith Hill’s background vocalist and toured with her for four years. This led to other opportunities from Billy Bob Thornton to her hero Willie Nelson and eventually head Show Dog Toby Keith, whom she has backed up for the past seven years.